So when coming up with this story about mummies vs aliens, I wanted to find a way to keep things within the context of the world. Magic and mysticism doesn’t exist in the world of Albert the Alien. Only science. And so, we needed a way to bring a mummy back to life without some curse or spell or something strange like that. Enter The Controller: Albert’s deus ex machine that gets them into trouble – and occasionally gets them out of it, too. I realized early on when writing this series that Albert can’t have an alien gadget that always solves the problem. Like any kid on Earth, his parents don’t have an unlimited supply of money to buy him everything he wants. Nor should they even if they did. Now, I did give him a way to access all of his alien stuff – his locker that works like a cloud for physical items – but I still wanted to keep his inventory fairly limited. So The Controller becomes a standard item. 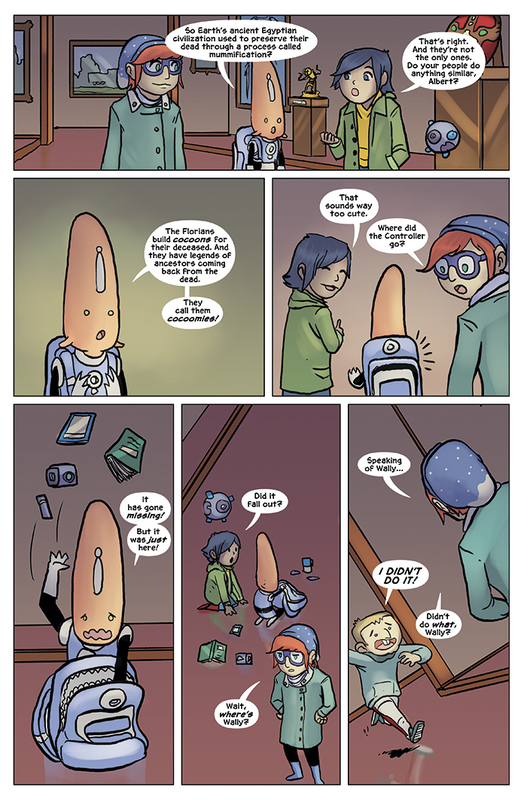 And it wasn’t even Albert’s item – they found it by that mysterious alien door in the basement of their school! Now that said, I was also trying to come up with something similar to mummies but from Albert’s culture. And with that, I came up with the idea of cocoomies – aliens that cocoon themselves when they die. “Cocoomies” seriously just sounds like a super cute word, doesn’t it? However, I’m sure if we ever see them they will be super scary. And maybe some day we will. Maybe. For now, though, it looks like Wally’s just been caught. How will he explain himself out of this one? We’ll find out next time! This weekend is my last convention appearance for the year: Con Alt Del! Join myself and Albert the Alien artist Gabo for a fun weekend filled with panels, comics, anime, and so much more! I hope to see you there!